Steve and Pattie Hood wanted an escape. The Springfield-based couple travels regularly. They’ve stamped their passports in beautiful locales like Italy and Argentina, and they’ve visited 47 states. 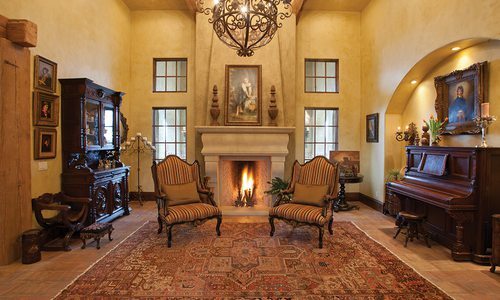 When building a vacation home became a possibility, Pattie immediately thought of New Mexico. She began collecting Native American artifacts during childhood trips to Oklahoma; then, upon visiting Santa Fe, her true passion for the American Southwest was born. 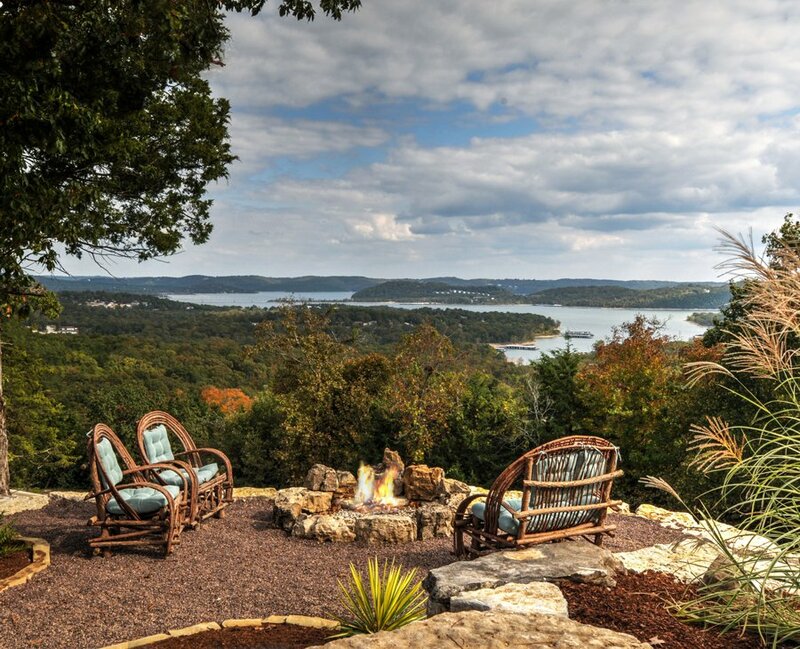 That passion sparked an idea: Why not bring the Southwest to the Ozark mountains? 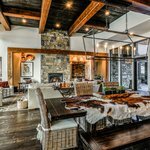 Pattie envisioned the perfect lakeside getaway with rustic touches inspired by her love of Santa Fe and Steve’s love of Napa Valley. Most importantly, the home needed to be close enough to make every weekend feel like a vacation. That’s how The House at Two Rivers came to be. 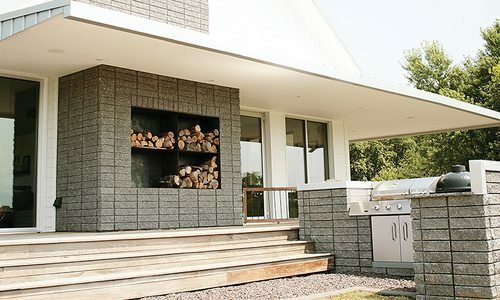 The home’s back porch overlooks the point at which the White and James rivers meet, and everything about the home celebrates the beauty of the outdoors. 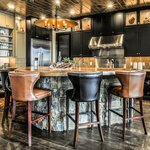 It’s the product of a strong vision, which Pattie executed with the help of Euro World Design, Schaeffer-Mitchell Construction and longtime friend and designer Cindy Love of Cindy Love Interiors. 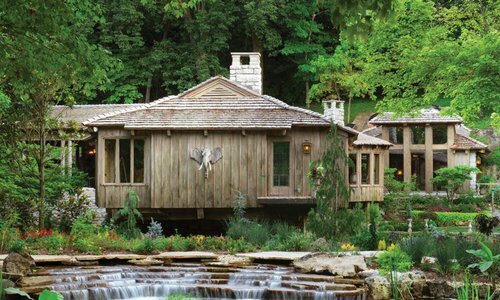 The collaboration resulted in a spectacular home away from home that combines the charm of the Southwest and the beauty of the Ozark mountains. 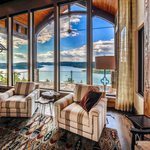 Photo by JK Real Estate PhotographyThe living room’s enormous windows are five feet wide and 12 feet tall—the largest residential windows available from Andersen Windows. This space is designer Cindy Love’s favorite in the house for a few reasons. First, the view. “Their sunsets are insane,” Love says. She also loves the flat-weave wool tribal-print rug. “The rugs dictated the rest of the colors in the house,” she explains. They served as an anchor for the design and inspired nearly every other element including tile and granite. 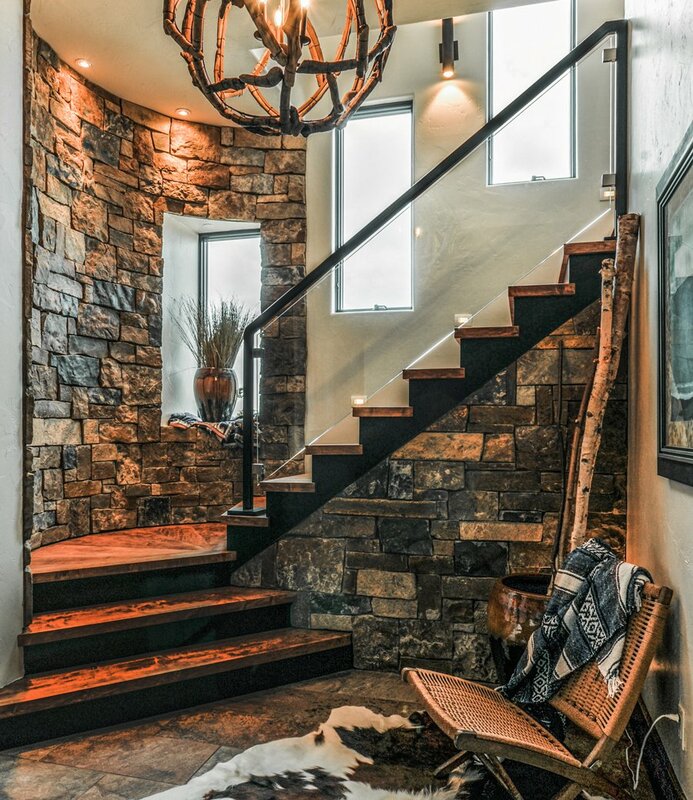 Photo by JK Real Estate PhotographyThe Hoods’ vision included an open plan with plenty of light. “It’s just excellent for entertaining,” says designer Cindy Love. The sunny room can heat up quickly in the afternoons, so the windows are equipped with remote-controlled shade systems. 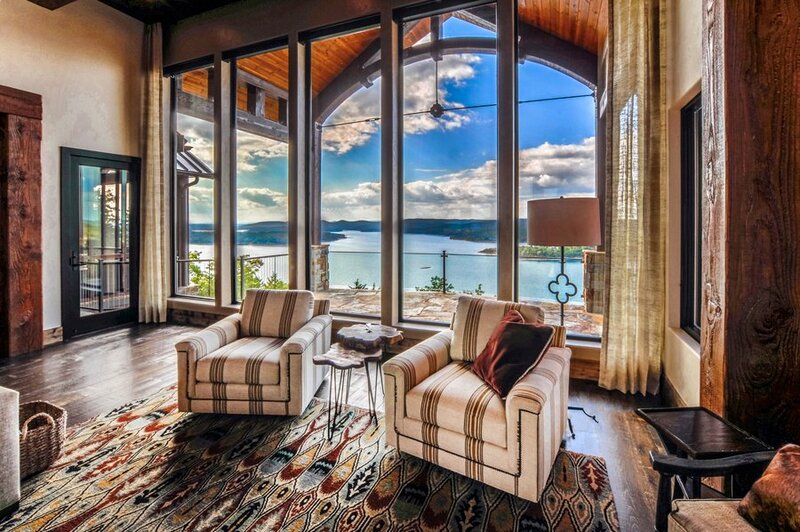 Natural light still pours in, contrasting with the dark Jacobean-stained pine flooring. 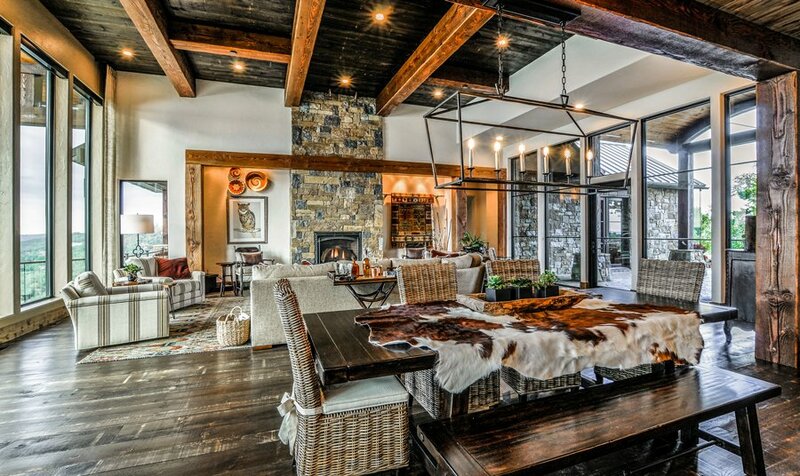 The main room’s rustic feel extends to the wood-burning fireplace, which features a raised cantilever hearth made of rusted iron. 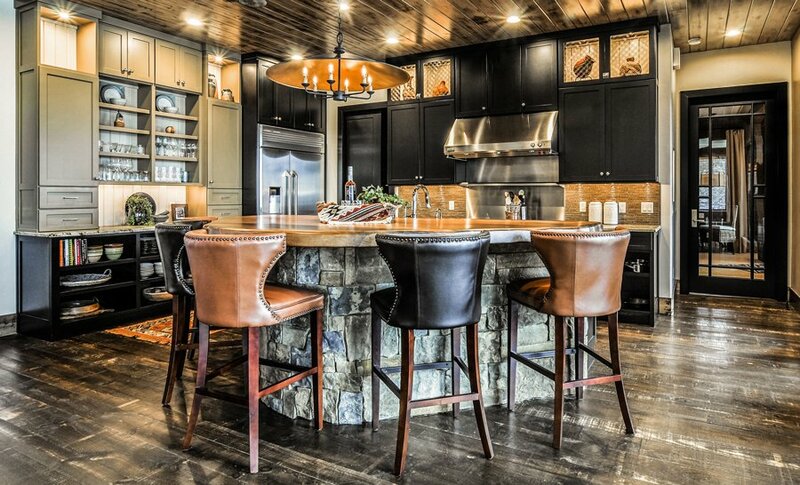 The large dining table is topped with an authentic calf skin to add Southwestern flair. Photo by JK Real Estate PhotographyPattie is an avid cook and needed an open, functional kitchen. She opted for commercial appliances and open kitchen cabinets for functionality and a touch of class. After dinner is served, the space also serves as a casual dining spot. Guests can be seated at the triangular island that features a gleaming sycamore tabletop sourced from the area and built by local artisan Rick Braun. Steve loves the island’s shape, which he says encourages conversation and a fun, social atmosphere. 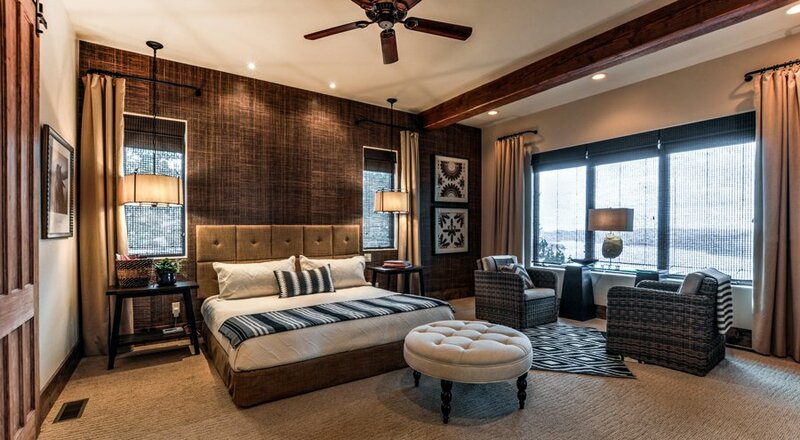 Photo by JK Real Estate PhotographyThe master bedroom reflects Pattie’s love of rough textures and a soft, sophisticated palette. 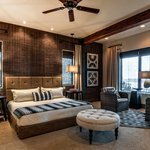 Designer Cindy Love used grasscloth wallpaper and woven wood window shades to give the space a more natural feel combined with an earthy color palette featuring warm camel, black and white. The drum lights hanging on the ceiling free up the nightstand space on either side of the bed. 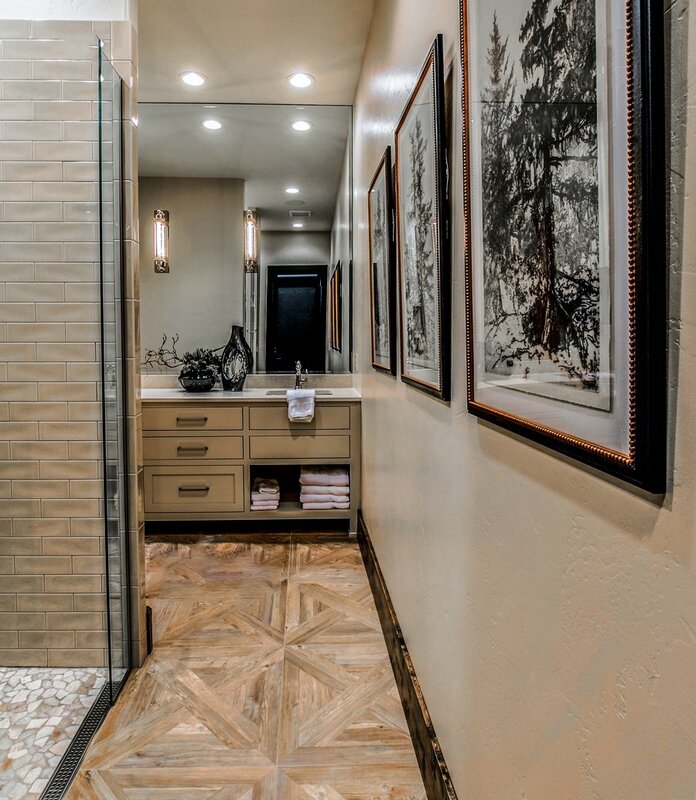 Photo by JK Real Estate PhotographyThe flooring in the master bathroom looks like wood, but is actually enormous 24-inch tile squares. 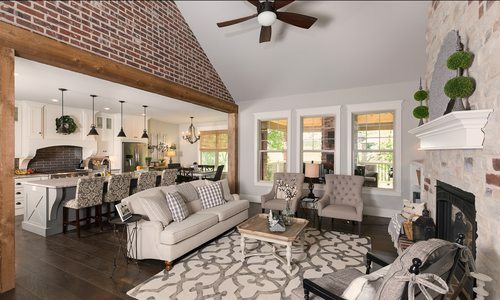 Most of the tile in the home came from Unique Tile in Nixa. The bright bathroom is free of frills, which is just fine for Steve—he prefers the outdoor shower. It’s connected to the master bathroom by a small pathway and allows the Hoods to enjoy a gorgeous lake view on the privacy of their large lot. 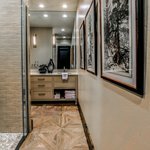 “We wanted it to be like a vacation every time we came,” says Pattie, who takes pride in the little details that add a touch of luxury. Photo by JK Real Estate Photography“Details are something I excel at,” Pattie says. 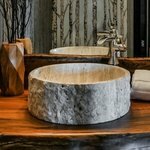 It’s true: The home’s details are myriad, like this petrified wood sink in the basement powder bath. 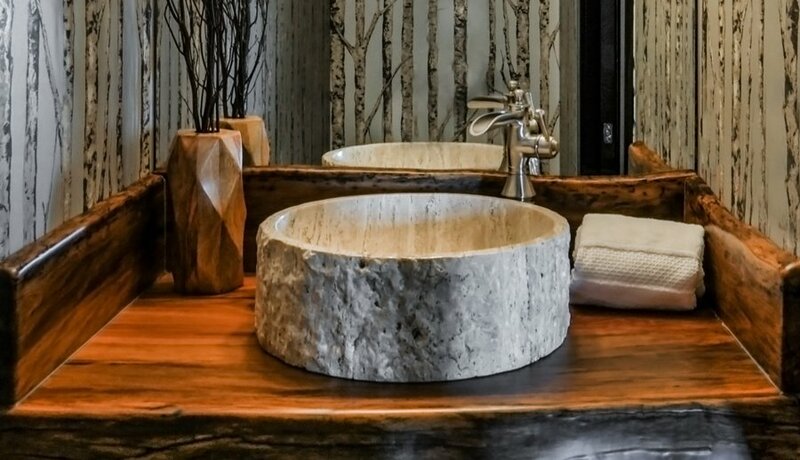 The sink is placed on a sycamore counter made by Rick Braun. 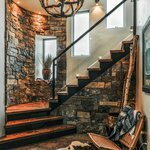 Basements are an easy place to skimp on details, but this one remains as well thought-out as the rest of the home.